Over 80% of applications are accessed over the Web. SAP, Business Objects and Salesforce.com, along with collaboration applications like Sharepoint, are all dependent on the same bandwidth. How do you optimize bandwidth to ensure these applications are performing within acceptable SLAs? 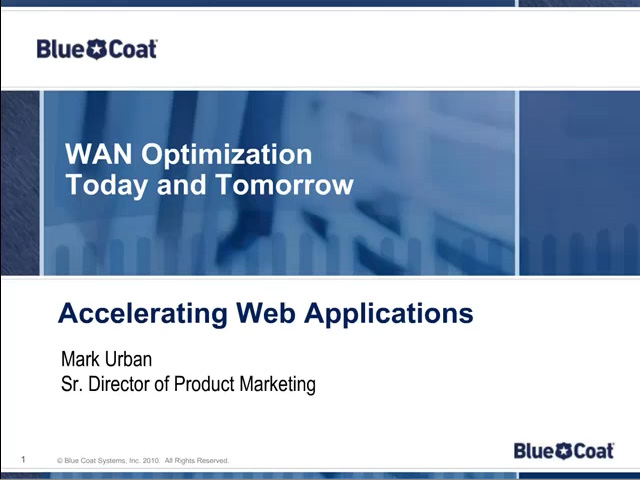 Acceleration is achieved with Blue Coat’s leading edge optimization technologies. Learn how WAN content can be served locally to eliminate latency and save massive amounts of bandwidth. It’s time to consider new ways to offload centralized servers and accelerate private and public clouds.